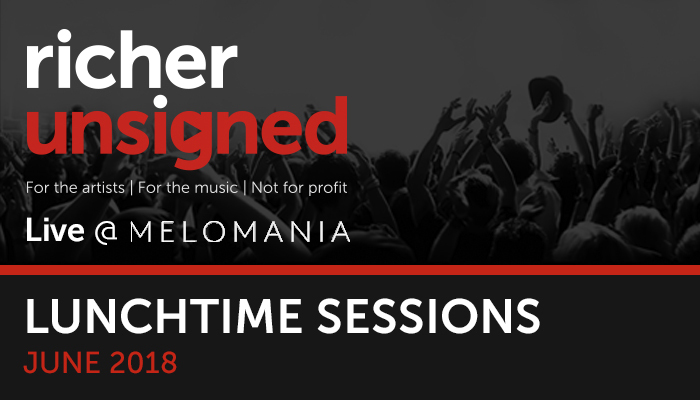 With festival season soon approaching and spring seeming like all but a distant memory, we thought we would invite two incredible acts down to Cambridge Audio’s Melomania event space once again to give us a taste of what summer has in store. To kick things off we had Jerry Williams, a singer- songwriter from Portsmouth who has spent the last ten years honing her craft for the stage. This translated perfectly on stage as Jerry delivered an impressive vocal performance accompanied by her dreamy guitar work. We sat down with Jerry Williams to ask her about Richer Unsigned and how we help artists by getting them on a platform. “I’m happy to be part of it” Williams replies, her enthusiasm for Richer Unsigned really showed in her eagerness to perform “It’s amazing and it gives great exposure to unsigned artists, Richer Unsigned really helps these artists to breakthrough on the radar”. Jerry Williams gave us a captivating performance and she is definitely one for the future. You can check out her latest single ‘Left and Right’ on iTunes and available to stream on Spotify. Jerry Williams is also playing Victorious Festival in her hometown of Portsmouth on 26th August. Next up we had a band from Maidstone, Kent called Rattlesnake comprising of band members Danny (vocals), Gary (bass), James (drums) and Jonah (guitar). Previously meeting at school, their combined sounds of 80’s synth magic with guitar sounds paying homage to the noughties indie sound, Rattlesnake are band to watch out for. Talking about Richer Unsigned, Rattlesnake explain “It’s very hard when you are a musician to find such an accessible platform” beaming with confidence they continue to talk about the impact Richer Unsigned has on them “It is very cool to be invited down to play, sometimes it can take an artist such a long time to finally get their first few gigs, but to be invited is great”. Their performance bolstered energy and great potential for the band to come. Rattlesnake have a new single in the works so that is certainly one to watch out for. Once again, big thank you for everyone that came down and a bigger thank for to each artist that came down for another successful Richer Unsigned session!